A drive in the mountains. Driving into the mountains again and the weather has just broken – first monsoon rain, or just like that? I don’t know, but there is nothing quite like driving through the plains on a lovely cloudy day, with spattering rain and know you are headed into the hills. 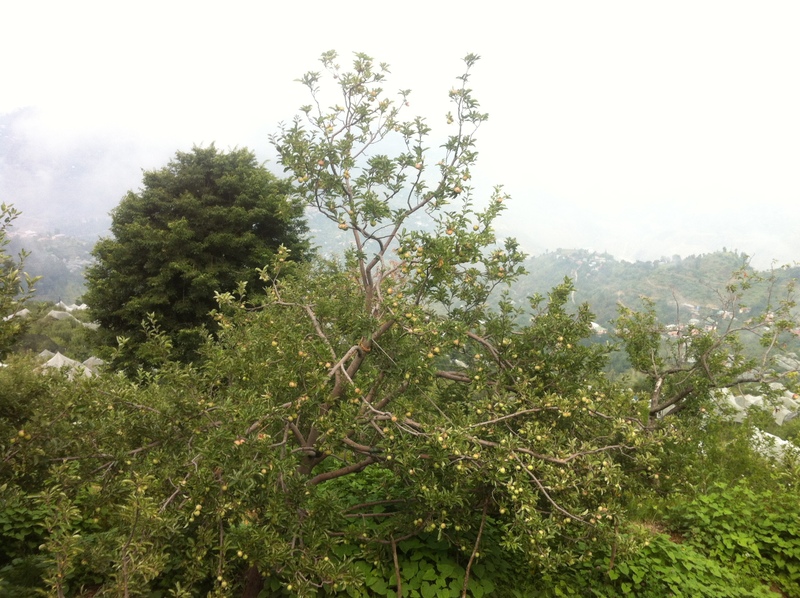 We completed a meeting in Simla, by which time the spattering rain was a full blooded downpour. The roads ran like rivers, iffy visibility, even with the wipers going crazily back and forth. Then of course came the misty bits, only once we got off the main road – obviously – so each curve of that little track appeared in slow motion in the beams that were already reflected back off the swirling mist. 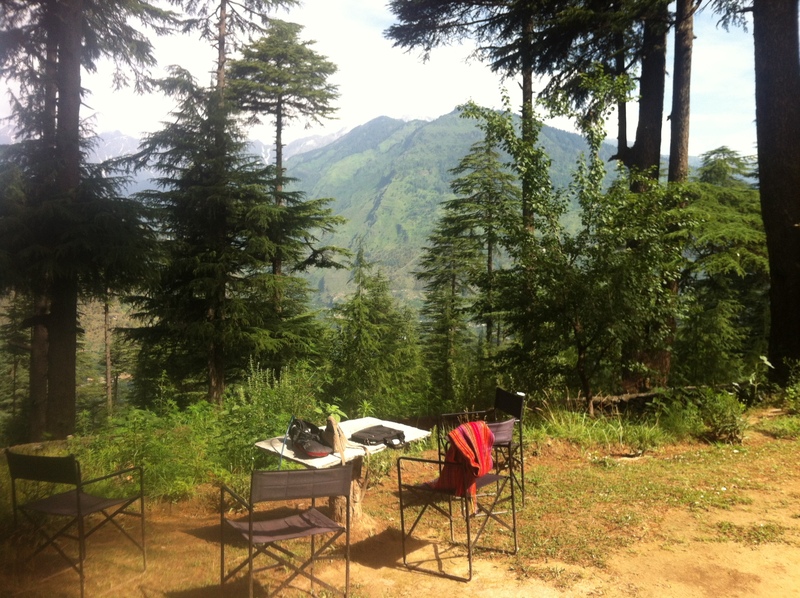 A lovely adventure that has brought us to this very comfortable Banjara Orchard Retreat at Thanedar. Warm rooms, neat bathrooms and a lovely dinner. The view I shall describe tomorrow – as I can see only twinkling lights on the far hills at this point. So the morning. 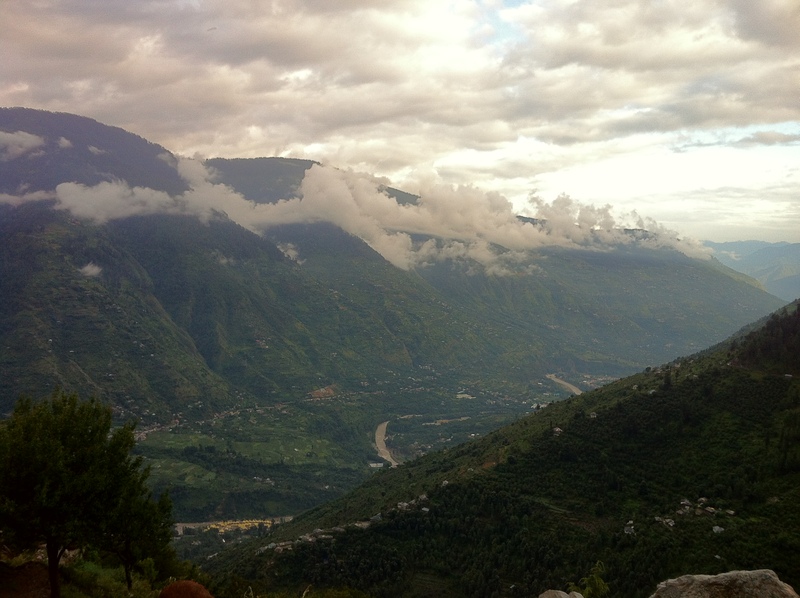 A view straight down to the Sutlej and across to where we are going – the Jalori pass. Right outside my window are ripening apples. Oldest church in India 1872, Saint Mary’s Church a walk through the orchards of an hour and a half gets you to the church, and you can choose to make a long walk of it or have a car pick you up on the return. 2. 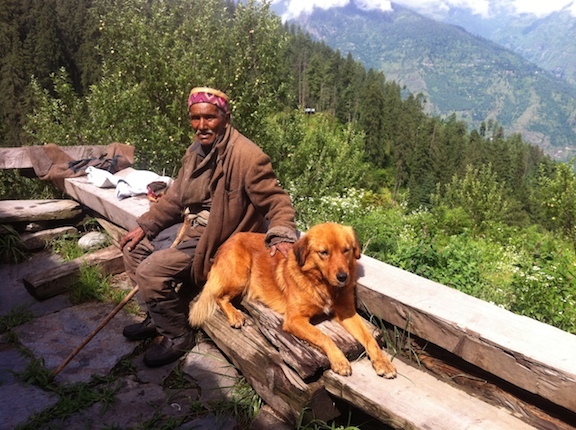 Saroga with Thakur sahib, who will tell you the stories of the area walking through the forest. 3. 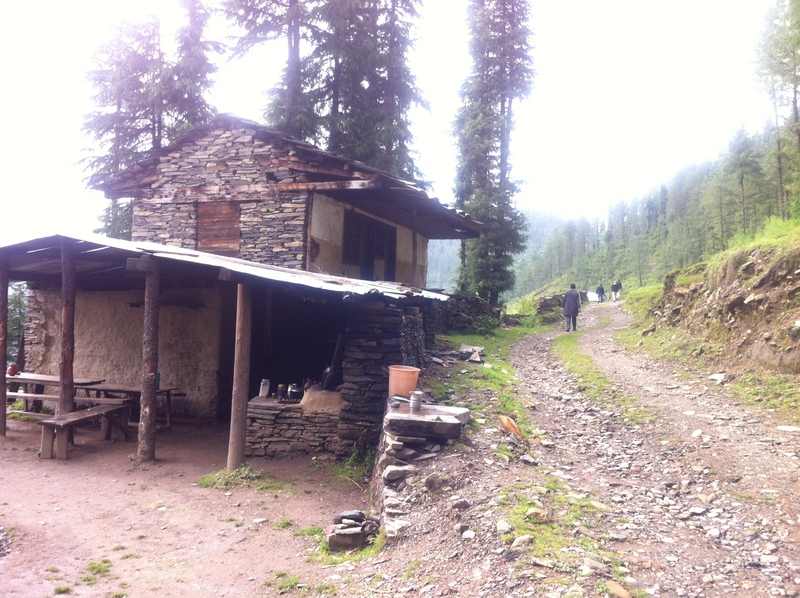 Drive to Tikkar, start climbing to Sidhpur and on to Hatu peak and back starting at 8000 ft and climbing to 11500 ft to visit the temple, walk down the other side. A full day hike through orchards and forests with spectacular views. All this I got from the very genteel Thakur Sahib over an extremely fulfilling breakfast. I would love to go on the walk with him, n he is a font of information about all facets of the area – not discounting that he is also an extremely charming gentleman. 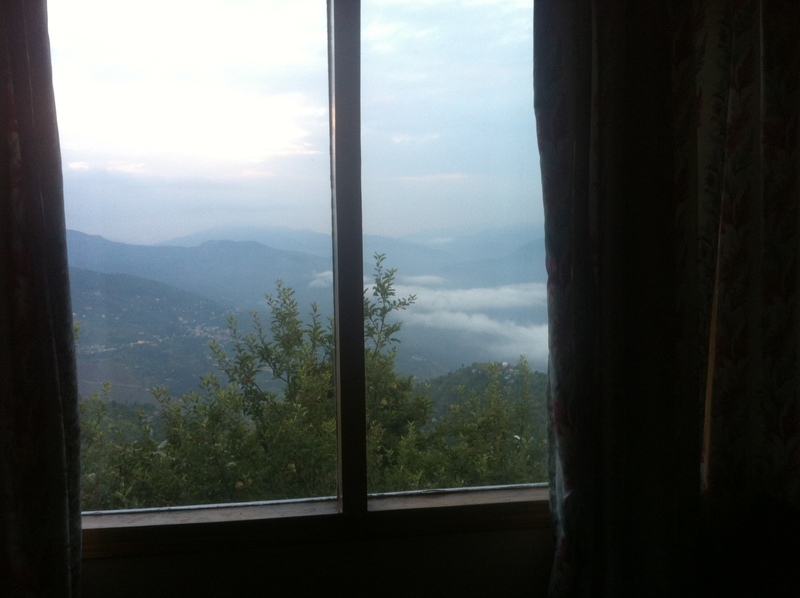 I am sitting on the balcony of a beautifully restored Himachali home, watchig the clouds drifting between the thickly forested mountains off the Jalori pass. It’s a drive I have done myriad times and it never fails to enchant. We took the back route which goes through little villages and climbs unrealistically up sharp hair pins with loose boulders. 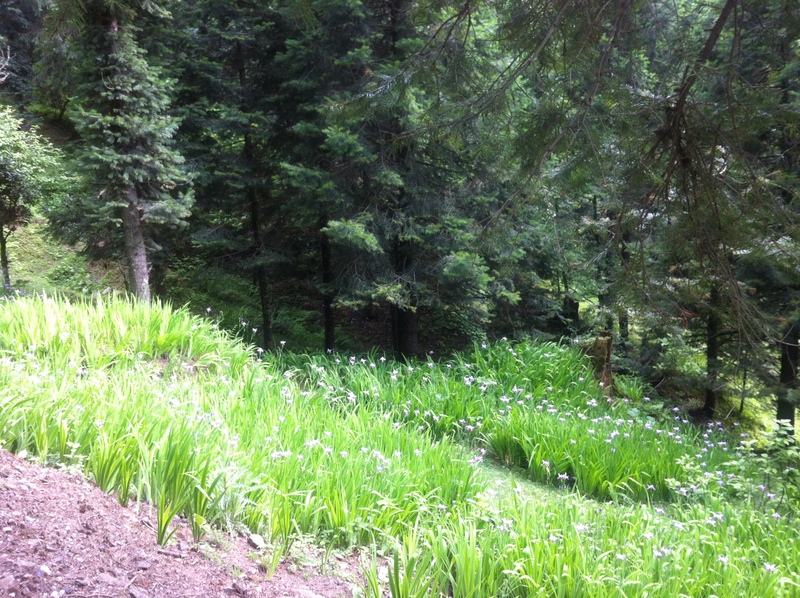 Hillsides carpeted in purple irises interspersed with wild, red strawberries, thick deodar forest. Undrivable, lumpy roads full of slush – it’s why I love the 4×4 – you can get to these places. We have arrived at the Banjara Camp at Shoja. It lies at the end of a little village, overlooking the valley. You look down off the balcony and fields of vegetables interspersed with apple and plum trees fall in steep terraces below and across are thick forests. Two converted old homes, large comfortable rooms and bathrooms, opening onto deep balconies where you can laze the days away watching the changing vistas of a monsoon day, or soak the sun and catch the spreading views of range upon range of mountains. It is still pouring rain as we leave from Sojha down into the Tirtan river valley to visit my old friend Raju in what I would term one of my favourite holiday destinations. 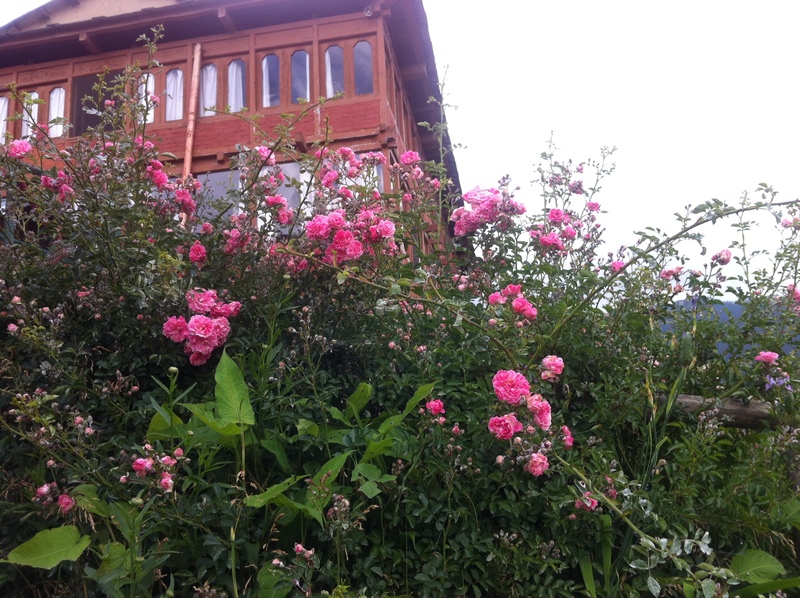 Raju’s cottage, sitting on the banks of the Tirthan river, crossing the jhula in the rain over a roiling river, meeting Lataji and her new daughter in law, and the greatest surprise of all, running into both Cookie and Shaheen. Had a lovely breakfast with all the homemade juices, jams, parathas and the amazing dahi from the fresh milk that Latajis cows provide. I could have just stayed there, but we had a long day of discovery ahead of us so on we drove. 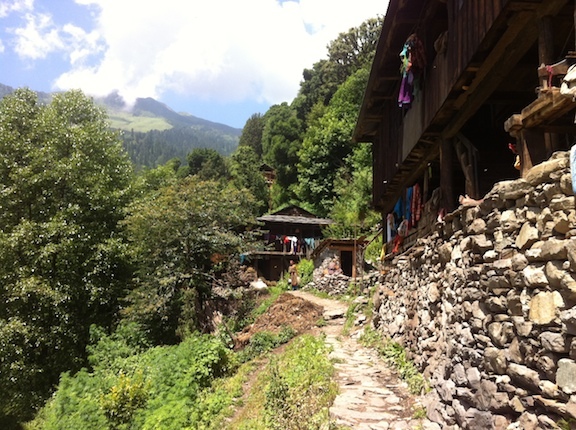 First to check out another little home stay at Deori along the Tirthan a little lower. Nice two bedroom cottage on the banks of one of the side streams. Then on to find someone to fix our car battery which is completely gone and necessitates us parking on slopes or pushing the car. After having done that we drove up the Pah Nala to a beautiful home that is being built by the side of the nala, I want to live there. Mr. Jamwal who owns the place knew about the upper road from Raison to Kullu that Pia and I had wandered many years ago – so we followed it and discovered lovely villages, a hair raising road, a completely off road track leading to a high village and superb views of the whole kullu valley. We have now arrived at the Sunogi homestead, which I shall discover in the morning. It is reminiscent of all the family summer homes. I could be at York cottage in Dalhousie or at Pavit’s in Mashobra. 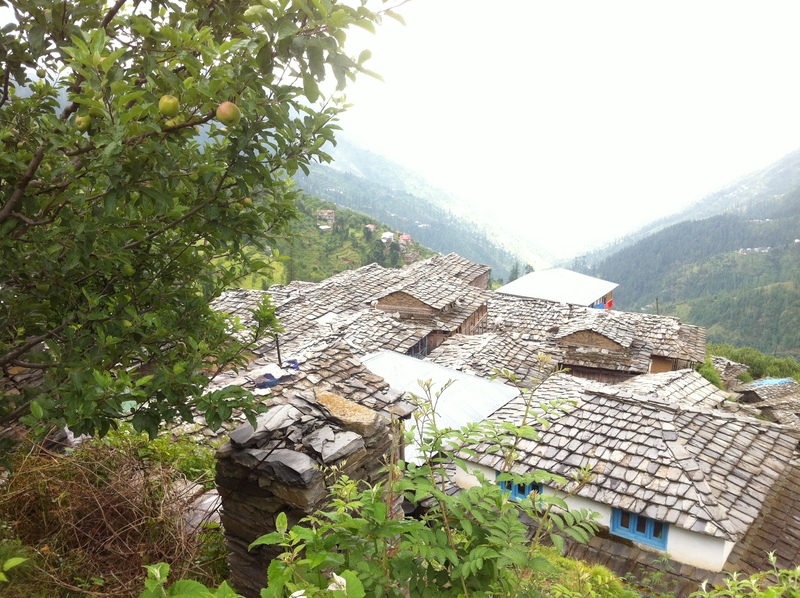 Traditional himachali architecture, added and improved to provide the comforts of great bathrooms and interesting bedrooms with touches of unique individuality. A fabulous, large, central fireplace dominates the dining room – you could roast the proverbial ox. The food is homely and tasty. 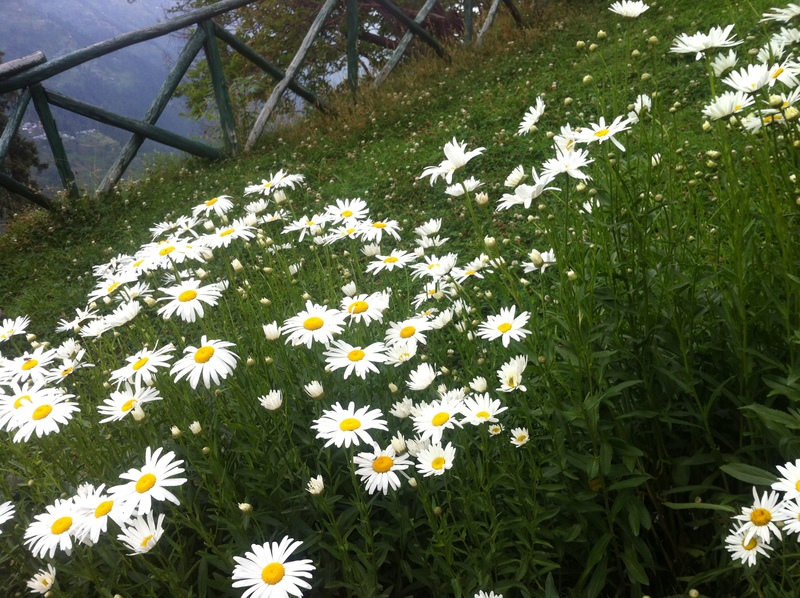 The whole sense, at least for me was exceptional quality and comfort. The drive to arrive at this special spot is much like the climb to York, tiny little ‘kacha’ road winding through monstrous deodars which will prevent you tumbling down the hillside but unless you know how to control your machine, you will leave notches in the those old trunks. So all inexperienced drivers, park and walk, intrepid drivers can try their skill. Probably best to have a 4×4 though. 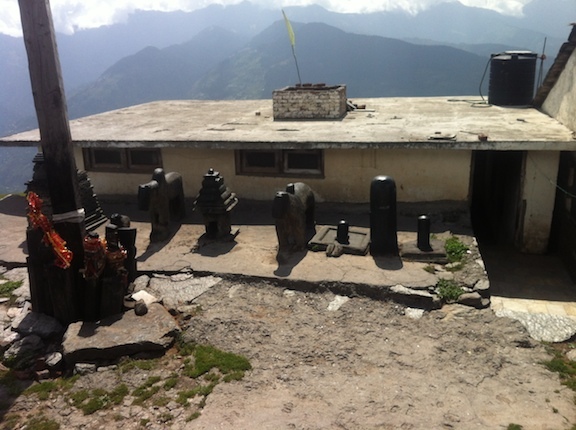 It has finally stopped raining and we have a clear, sunny day to try our bit at exploring the road to Bijli Mahadev. I saw some of the thickest tallest Deodars on this wild drive to the meadows of Bijli Mahadev. A dirt road, 4×4 all the way, just beautiful wilderness. Such an array of wild flowers, buttercups kissing cheeks with wild strawberries. Deodar, horse chestnut, huge himalayan oaks. Crazy streams threatening to wash away the road, fat boulders and tree trunks wanting to stop your path and finally to emerge on the ridge top to views of the Beas on one side and the Parvati on the other. The sky’s threatened to pour, but stayed clear for us. Kathguni style used for animals now!! needs to help us acknowledge traditional wisdom. just short of it so there will still be lots to explore in the future. Today we discovered the most beautiful old village, up and up the road from Raison. 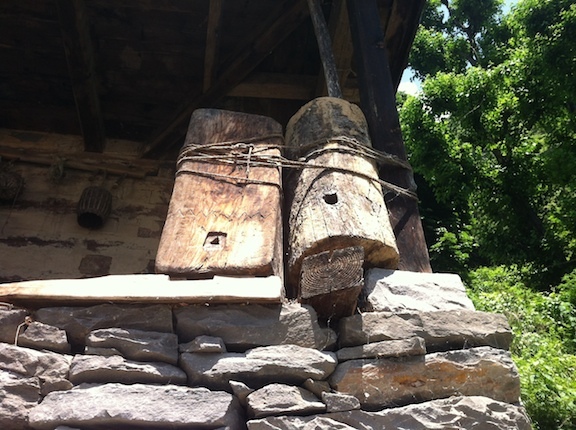 Himri; of wooden homes that still have traditional beekeeping logs on their balconies. At the head of the valley. The time has stood still here and you can access the high meadows above Himri and through forests and magical mountain views, cross into the valleys on either side without ever touching the hum drums of the lower valley where roads and ugly structures exist. 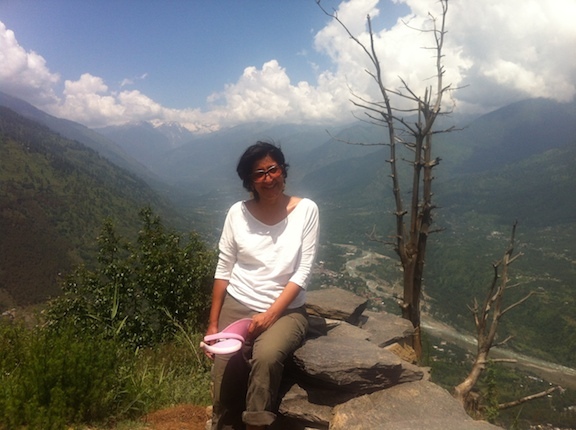 We did drive back down and up into the Faujal nala to see what we could see, and sure enough – Faujal has turned into a teeming place with cafes and what nots, but you clamber up a side road to discover the orchards and scattered homes of Dhara village with spectacular views up and down the Kullu valley again. This has been a week of discovering hidden gems. May they stay glowing in their uncut splendour. 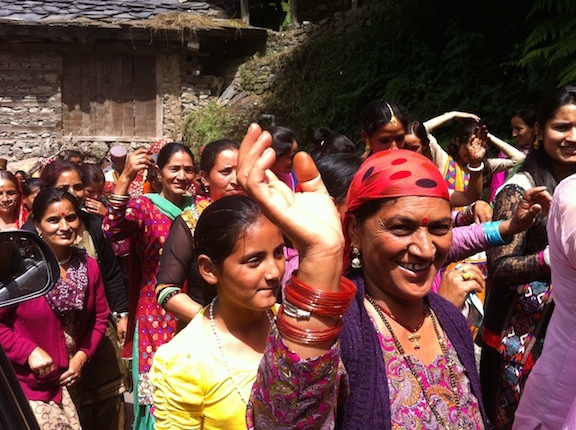 This entry was posted in Travel stories and tagged explore, himalaya, mountains, travel stories. Bookmark the permalink.